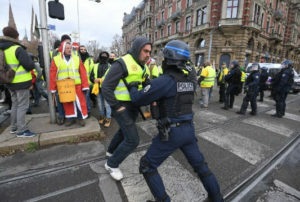 The revolution with the Yellow Jackets & the French people. I don’t know if a lot of people in the United States are following what’s going on in my country: France. To be honest, when I left .. already 24 years ago .. I told my parents: “one of those days, you gonna have a big revolution ! !” Well, it took 24 years !! What’s the problem in France you may say. Actually, it’s very simple. Since 50 / 60 years, the French politicians (right/middle/left), did almost nothing to reform the country. Some politician tried, but without success. Same healthcare, same insurance, same tax bracket etc .. for EVERYBODY. No more “free” apartment, free car with driver or free whatever for elected officials. NOTHING IS FREE in this world. 62 years old: You are OUT (retirement FOR EVERYBODY– INCLUDING THE PRESIDENT ). You still want to work in the public sector .. well, it’s very simple for you: YOU WON’T GET PAID, OR YOU WON’T GET PRIVILEGES BECAUSE YOU “WORK” FOR FREE !! Because you’ve been elected, you need to be present to all the meetings. and the list goes … but you see the picture. Second: After you did that, Mr Macron, You CAN ASK THE PEOPLE TO DO SOMETHING FOR THE COUNTRY !!! Unfortunately, it’s almost impossible …. unless, Mr Macron becomes a dictator FOR THE PEOPLE, TO THE PEOPLE of France. Staying on this path, will create, probably a civil war in France … and maybe in Europe.